So I’ve been meaning to make this sausage ever since my sage plant started taking off in early May. I had no idea what to do with it, never really cooking with fresh sage before, but I knew apple-sage sausage was a thing and decided to make some when apples came into season. This pork sausage is some of the best sausage I’ve ever had. Boasting only four main ingredients, it’s free of all the added sugar and chemicals most processed sausage contains. It doesn’t take much to coax flavor out of good-quality pork (and I have to say that apples and sage do a mighty fine job!). Sage and fennel hit the pallet first when biting into these patties giving them a rustic flavor, followed by the sweet and autumn-y finish of apple. 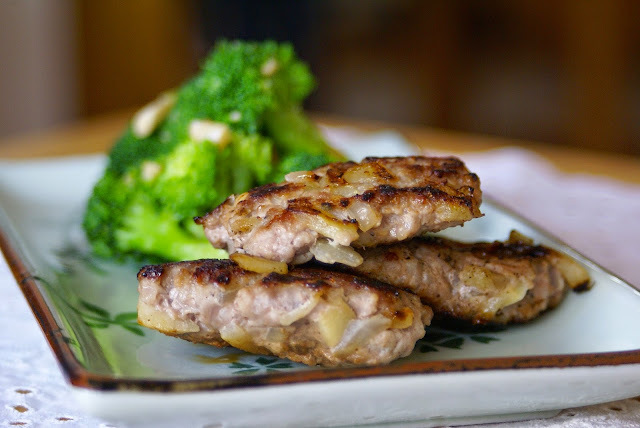 You can make these into patties or ground sausage with hash browns or stuffing. 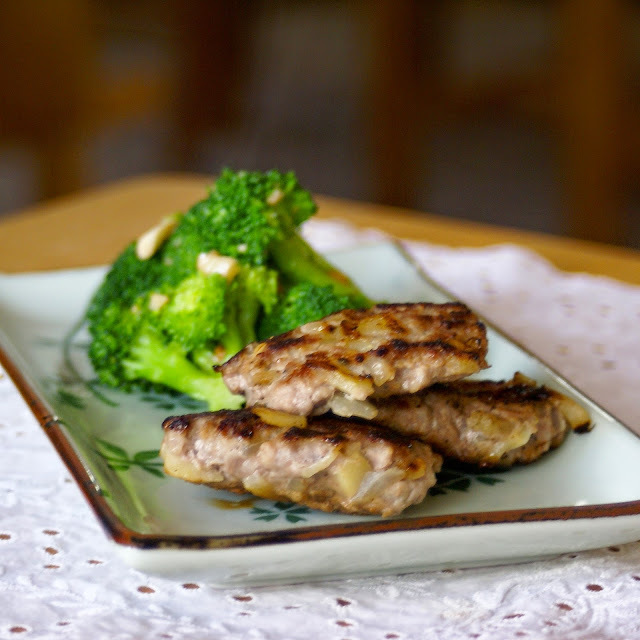 I served a few patties for lunch with some sautéed garlic broccoli and a little bit of mustard. Full of flavor, it doesn’t take much to enjoy this apple sage sausage! 1. Heat a cast iron skilled over medium heat. Add 1/2 Tbsp butter, apple, and onion to the pan. Saute for 7-10 minutes, or until the apples and onions are soft and translucent. Allow to cool for 5 minutes. 2. Mix the ground pork, sage, crushed fennel, salt, pepper, and cooled apple-onion mixture. Break into 16 small balls and flatten, so each is about 1/2 inch thick and 3″ across. I usually start with one large ball, then half it four times so I am left with 16 equal sized balls. 3. Heat the cast iron skillet over medium-high heat with 1/2 Tbsp butter. Salt the top of the uncooked patties. 4. Once hot, add the patties salt-side down and cook for 3 minutes on each side. Salt the top of the patties before flipping. Cook the patties in batches, depending on the side of your pan, adding 1/2 Tbsp butter before adding each new batch. Serve warm and enjoy!